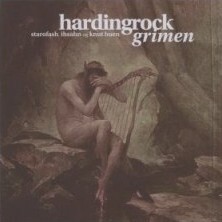 Grimen is an album of Hardingrock, a project of Ihsahn (Emporer), his wife Starofash and the Norwegian folk musician Knut Buen. It starts with Daudingen... Knut Buen is narrating and in the background you hear some keyboards. For the ones like me who don't speak Norwegian, it's a bit one-dimensional... like an audio book in a language you don't understand. Luckily a bit later Starofash is adding some vocal lines and with the Hardanger fiddle or hardingfele it gets more interesting - Edvard Grieg used Hardanger fiddle in his Peer Gynt and it was also used in the soundtrack for The Lord Of The Rings trilogy, so you might heard this instrument before.... Not quite entertaining... I think when you understand the words it's way better. With Fanitullen - also called Devil's Tunes - it gets more heavy and a bit more metallic... Btw, the legend says that a fiddler got this 'troll tuning' from the devil for Fanitullen, but this tuning is limiting the melodic range. Fanitullen isnn't quite folk metal, but well... A combination of classic metal with folk elements and hardingfele. It even has a slightly 70's prog rock touch, but they don't really get me. At some songs there are very heavy parts and it gets almost to some black / death metal sounds, but too many folk parts for me and too much narrating. This heavy side is well shown at Fossegrimen. The songs are well played and arranged, but its a crude mixture with the folk parts, the metallic sounds, even some reminiscences to black metal - mainly Ihsahn's vocal parts - and the narrated parts. Some might find this mixture interesting and can really enjoy it, but for me it don't work. Even if there are some interesting parts. To get an idea, listen to: Faens Marsj, Fanitullen and Fossegrimen.